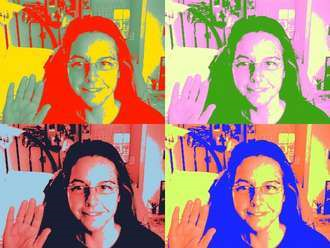 In 1997, Stacey Pierrot came out with her Rosamond webpage, that employed a minor as a smokescreen to conceal her criminal attempt at Art Forgery. Indeed, she employs a children’s hospital, and Christine Rosamond Benton’s eleven year old daughter and heir, to prepare Rosamond’s loyal fans for massive Art Fraud. How many contacted Ms. Pierrot and asked if they could contribute to this fake charity? How many designers called and asked if Rosamond’s Dunkin could be put on their “tote bag” or, designer dress? How would you like to awaken in a bed full of toads? 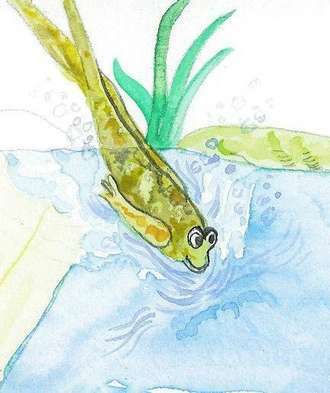 Sandra Faulkner painted ‘Dunkin The Frog’ and I can prove it. Is it included in Lynche’s book? The image of a Art Imposter going around to hospitals in the Monterey area, and handing out fake Rosamond’s to injured and dying children, is the most diabolical scheme in the history of art. Are these scammers – INSANE? This is very witchy, and borders on the occult. Christine Rosamond has come back as a benevolent money-making frog who roams the halls of children’s hospitals. This is a pseudo-religion. Now throw in some mysterious ‘Lesbian Love’ and the balls in your court ‘Lovers of Rosamond’. 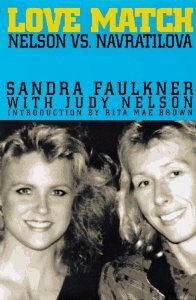 I wrote a letter to the Probate Court and informed them of the Art Forgery, that was compounded by the lie Sandra Faulkner conducted interviews with my sister – before she drowned. I told the Court Faulkner’s notes were intellectual property that belonged to the heirs, my two nieces. Why didn’t Morris mention Faulkner in his legal summation of the Probate? Why didn’t Pierrot hand over Faulkner’s interview to her new biographer, Tom Snyder, so he could quote a world famous artist? Vicki Presco told me Faulkner quit the project and embezzled a substantial advance. I doubt this is true. Mr. Morris should have made an attempt to recover these monies – if true! I doubt my sister read ‘Love Match’. The Gay Community is being used to commit Art Forgery. Lesbians did not get behind Faulkner, and see her as their savior. Pierrot has give Sandra – a second chance! The result of this covert and criminal activity, and my exposure of it, was my complete alienation from my family who disowned me and kept me in the dark on matters concerning the disappearance of my minor child who was lured int the camp of the Art Forgers. To publish images of Christine’s art with false documentation of work not rendered by her, is Art Forgery. In the late 70s, Christine had taken her promoter, Ira Cohen, to court in order to keep her images off the crap Pierrot wants to put it on. The reputation of the two Creative Presco Children, has been severely damaged. An attempt to thwart my autobiography, was launched because I knew the truth! 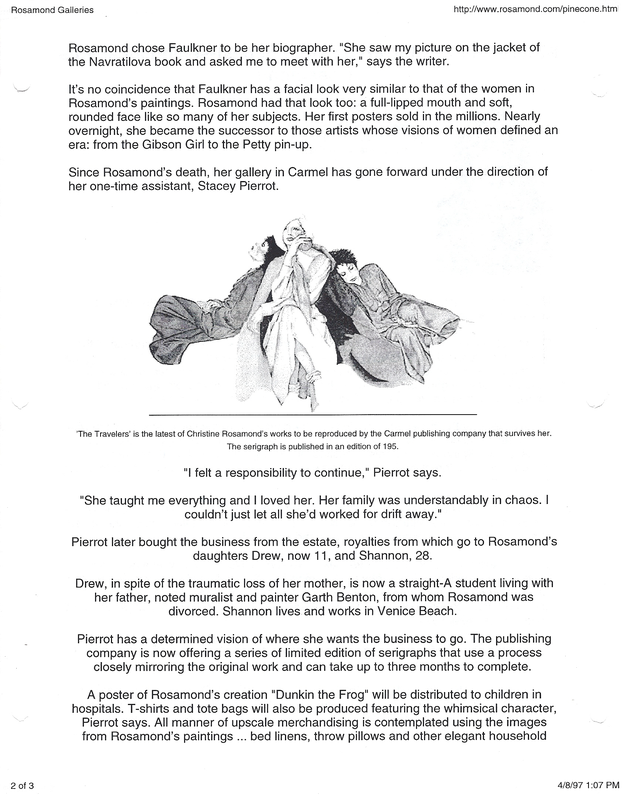 Stacey Pierrot did not receive permission from Rosamond to betray her Art. 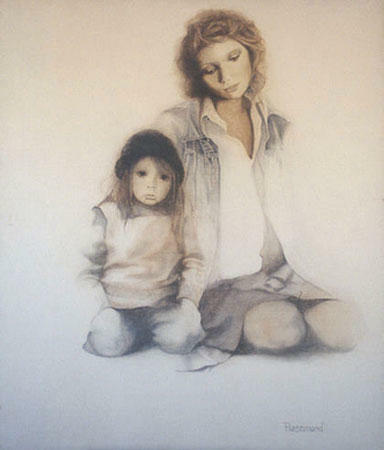 Pierrot did not get permission from a minor child to commit Art Fraud and Art Forgery. This criminal activity resulted in the destruction of Rosamond’s Creative Legacy. To employ Rosamond’s beautiful women as a smokescreen, and expect to get away it, is the worst outrage. These women were captured, and made Pierrot’s slaves, and the slaves of the Probate Court. Minor children were used and abused! from which go to Rosamond’s daughters, Drew now 11, and Shannon, 28. It was 40 years ago on New Year”s Day that photographer Edward Weston died at his home on Wildcat Hill in the Carmel Highlands. Despite decades of struggle, during which he never earned more than a few hundred dollars for images that are now regarded as masterworks of 20th century photography, Weston came to be recognized as one of modern photography”s true geniuses. In the five years since Brett Weston, Edward Weston”s second son, died at the age of 81 at his home on the Kona coast in Hawaii, he too has come to be regarded as a photographic genius in his own right, one whose singular vision and bold abstract landscapes anticipated and paralleled many of the major trends of 20th century art. Unlike his father, however, Brett Weston achieved substantial wealth during his lifetime. Abetted by the art boom of the late ”70s and ”80s, and the growing recognition of photography as a legitimate art form, many of Weston”s better-known images sold for upwards of $5,000 apiece. In addition, Weston earned hundreds of thousands of dollars from numerous book contracts and the sale of reproductions of his images. At the time of his passing, Weston left behind an estate valued at well over $2 million and an astonishing archive of some 30,000 photographs, spanning his entire, seven-decade career. Many of these images, all printed by Weston himself, have never been exhibited or reproduced. In order to assure both the value and integrity of his archive, Weston destroyed nearly 7,000 of his negatives-a bold act that defied art-world conventions and that continues to cause much debate and consternation among art historians. As art historians seek to evaluate Weston”s legacy and influence on 20th-century art and photography, it is Weston”s archive that will form the basis for much of that assessment. In terms of photographic history, the archive is priceless. But in the real world, where everything has a price, the archive and Weston”s legacy have become bones of contention. For the past year and a half, the county courthouse in Monterey has been the scene of a contentious and oftentimes bitter legal dispute over Brett Weston”s estate and the disposition of his photographic archive-one that could have far-reaching implications for the legacy of Weston”s artistic achievement. At the center of the dispute is Weston”s long-time agent and friend, Carol Williams, owner and director of the Photography West Gallery in Carmel, and Carmel attorney Sidney Morris, executor for the Weston estate. The point of contention between Williams and Morris has been the sale of Weston”s entire photographic archive to an Oklahoma banker and art collector named Christian Keesee, as well as the status of ongoing print sales, and a previous publishing contract between Weston and the Photography West Gallery. 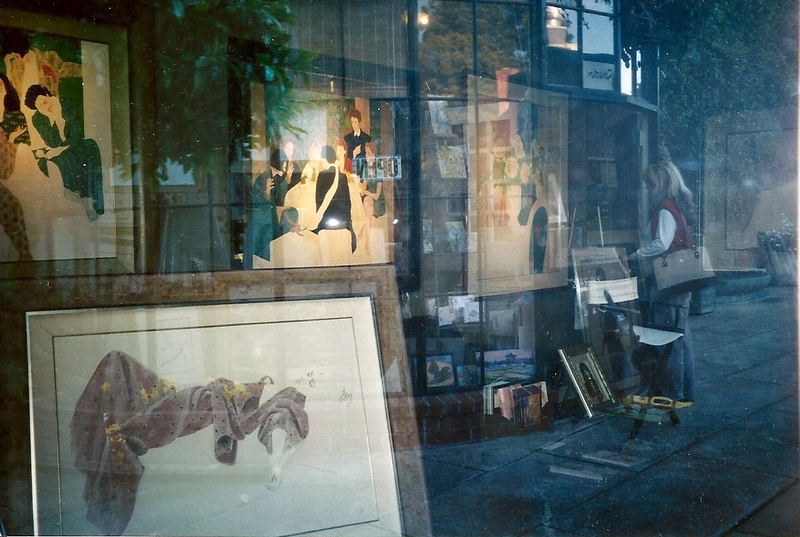 At issue is whether the sale to Keesee, which was finalized and approved by the court last summer despite efforts by Williams to overturn the sale, violated Weston”s expressed interests for his archive, and whether the sale will have a negative impact on the value of Weston”s work and its assessment by art historians. As suggested by a review of the court documents and interviews with many of the principals in the court case, the dispute over Weston”s estate has been a grotesque, acrimonious soap opera, replete with insinuations and outright charges of deception, theft, financial manipulation, malfeasance and mismanagement. The path to understanding the convoluted and confusing path that led to the sale of Weston”s archive to Keesee, is littered by a host of self-serving half-truths, dissembling and dissimulation by former friends, lovers, acquaintances and art-world associates of Weston that make the parties” motives and the truth difficult to ascertain. At the center of this legal miasma resides Brett Weston himself, a man who emerges from past interviews and conversations with friends and associates as an enigmatic and incongruous personality, a man whose intentions regarding his archive were never made clear and whose single-minded pursuit of his art often came at the expense of personal and professional relationships. In looking back at Brett Weston”s life and career as an artist, one is struck by the degree to which his art is inextricably linked to his relationships with women. Married and divorced four times, Weston engaged in countless personal relationships with women, many of whom assisted Weston professionally. From March of 1959 to August of 1992, less than five months before his death, Weston left as many as 10 wills with 16 codicils, with many of the amendations representing changes in executors and beneficiaries. According to Morris and former estate co-executor and Weston friend Bob Byers, there were 29 versions of estate plans for Weston during his lifetime, “the common theme being gifts to lady friends and family members and to ultimately take care of [Weston”s daughter and sole heir] Erica,” according to Morris. For Josephus Daniels, a respected Carmel photography dealer who represents some of Weston”s work, there is knowing amusement in the complicated and messy estate Weston left behind. “Brett was a very complex fellow yet simplistic in other ways,” says Daniels. “Brett”s world was very rigid and internalized and he had very specific ideas about the world of art and his relation to it. Over the years, Weston also vacillated over the disposition of his negatives, with earlier wills stipulating the destruction of any remaining negatives and later wills approving the donation of some negatives to educational institutions. Prior to his death, Weston did donate approximately 12 negatives to the Center For Creative Photography in Tucson, Ariz., and gave another dozen to his brother, the noted photographer Cole Weston. In both cases, all the negatives were sufficiently damaged to prevent future printing. What negatives have survived include several hundred images taken in Hawaii during the latter part of Weston”s life. None of these images are believed to have been printed, and according to Morris, these negatives have been donated to the Center as part of the sale to Keesee with instructions that they may never be printed. In his final codicil just months before his passing, Weston made one significant change in his will that bears significantly on the sale of his archive to Keesee. After writing numerous wills naming the San Francisco Museum of Modern art as the “remainder trust” beneficiary of his archive, Weston switched to the Center, reportedly through the importuning of Diane Nielsen, a photographer and personal friend who works for the Center, and who was named as a beneficiary of 25 prints in Weston”s will. That change came as a surprise to some Weston associates who say Weston had a longstanding enmity against the Center over its refusal to purchase his works as it had done for other photographers of equal stature, and its insistence that Weston donate images to the Center instead. Despite all the changes in Weston”s will over the years, the one constant and concern, all parties agree, was to see to it that his daughter Erica would be provided for. Given the complex and complicated nature of Weston”s personal life and the uncertainties surrounding his wills, it is not too surprising that his archive should have been in similar disarray. “In the four years the vault was in my possession, I could not deliver a single requested photograph because I didn”t have it or would have had to break up a portfolio,” says Morris, who says the archive, which was “poorly catalogued,” was twice appraised at around $1.2 million, not including the potential value from publishing and reproduction rights. As Brett Weston”s primary dealer for the last 13 years of his life, Carol Williams seemed an obvious choice to purchase Weston”s archive. Besides earning Weston hundreds of thousands of dollars over the years, Williams helped broaden the appreciation of Weston”s work through her gallery”s publication of three beautifully produced and highly regarded monographs of Weston images. Those books were published prior to Weston”s death as part of a five-book deal, the remainder of which is currently being disputed by Morris on behalf of the Weston estate. According to Williams, her personal and professional relationship with Weston gave her unique insight into the man and his art, and Williams remains a passionate and devoted believer in Weston and his artistic legacy. It was Williams” dream, and according to Williams, Brett”s desire as well, to see his work remain in Carmel. Williams says she intended, had she purchased the archive, to sell some of the collection in order to finance construction of a photography center or museum that would pay tribute to the entire Weston family, a family indelibly linked to the Carmel area. According to Williams, she was approached by Morris in the fall of ”95 to discuss the purchase of the archive. “Sidney told me it had been decided that the entire vault was going to be sold because Erica wanted money instead of prints,” says Williams. According to Morris, the estate had given consideration to managing Weston”s archive itself, but decided that such a time-consuming and complicated endeavor was not worth the potential financial risks and uncertainty. Prior to discussions with Williams, Morris approached the Center For Creative Photography as a possible buyer. As a research and educational institution housing more than 60,000 photographs, archives books and documents of such noted photographers as Edward Weston, Ansel Adams and Wynn Bullock, the Center seemed a likely choice. “As Brett”s executor, I hoped I could find some way to create a photographic legacy with the Center after it seemed unlikely the trust could market its entire collection during Erica”s lifetime,” says Morris. According to Morris, the Center declined to purchase the archive because of its unwillingness to take on the necessary financial obligations such a purchase would entail in terms of providing for Erica Weston and the estate. “We did pursue in some detail letting the Center have it, but they didn”t want to be responsible for generating income [for Erica and the estate],” explains Morris. Although the Center declined to purchase Weston”s archive, they were particularly interested in purchasing what is known as the 50th Anniversary Portfolio, a collection of 125 prints of Weston”s finest work spanning his entire career and assembled by noted photo-historians Beaumont and Nancy Newhall for an exhibit in Santa Fe, NM. in the 1970s. As discussions between Morris and Williams proceeded, and a figure of $1.5 million was proposed for purchase of the estate, Williams says she thought the deal would be completed, pending the approval of the sale by Erica and the Center, which Williams says Morris sought as a “”courtesy”” to the Center. But such approvals, says Morris, were not forthcoming. The response to the proposed sale to Williams, says Morris, was “strictly negative from Erica, and the Center was concerned about Carol personally and her business practices. They thought there would be a sale to another museum and they weren”t enamored with the idea,” says Morris, who insists that no deal was ever finalized between the estate and Williams. According to Williams, however, “the Center”s attorney told me they never objected to my offer.” Williams adds that Erica told her that her [Erica”s] objections were based on incomplete information regarding the terms of a possible sale to Williams. After repeated questioning, Morris conceded that the Center had no legal standing to object to the sale. Furthermore, the derogatory allusion to Williams” “business practices” begs the question why Morris would approach Williams in the first place if her business practices were in doubt, and why Weston himself placed such implicit trust in Williams over the years. Williams says it was only after she was told by Morris that the Center was going to purchase the archive for a larger sum, only to later find out it was sold to Keesee under terms and conditions she felt Brett would have objected to, did she eventually sue to block the sale in May of ”97. Williams” suit was eventually denied by Judge William Curtis citing Williams” lack of standing. Curtis later sanctioned Williams $10,000 after she pursued the suit further. Because the interpretation and recollection of the events surrounding the sale of Weston”s archive varies from person to person, it is difficult to ascertain what assurances, guarantees and/or promises were made to and by all the parties involved in the eventual sale of Weston”s archive to Keesee. The most likely explanation may have to do with the financial liabilities and benefits of the archive to the estate, the powerful influence of the Center, which benefited substantially from the sale of the archive to Keesee, and the role of Erica”s attorney and advisor Jim Rust, a St. Louis attorney who ended up brokering the deal between the estate and Keesee. The sale to Keesee, with the help of his agent Jon Burris, who now serves as curator of the Brett Weston Archive, was completed in November, 1996 following final negotiations in Oklahoma City. According to court documents, Keesee purchased the archive for the $1.5 million asking price, but only put $200,000 down, agreeing to pay off the additional $1.3 million balance in interest and principal in five years. In turn, the estate paid a 10 percent commission to Burris and agreed to take out a $300,000 loan from Keesee”s bank. According to Morris, the deal was structured in such a way as to reduce the estate”s overall tax burden, with the bank loan allowing the estate to pay off some of its debts. By deferring payment in full, says Morris, Keesee was able to keep more cash on hand to help finance planned exhibitions and publications of Weston”s work. In addition to the archive, Morris sold all reproduction rights to Keesee in an exclusive licensing agreement, giving Keesee the right to reproduce and publish Weston”s work for 25 years in exchange for 7 percent of the gross sales to the estate. It has been suggested by sources that those rights could be worth upwards of an additional $1 million. One of Keesee”s first moves has been to license 1,500 of Weston”s images to Bill Gates” Corbis Corp. of Bellevue, Wash., for electronic reproduction. Keesee retains final approval for any uses by Corbis, which has a similar agreement with the Ansel Adams Trust. According to Morris, the estate has relinquished all control over how Weston”s images can be used or marketed. As for the Center, it received the 50th Anniversary Portfolio from the estate, along with a donation from Keesee of somewhere between 1,000 and 2,000 prints not included in the sale, as well as several hundred negatives of Weston”s later Hawaii work. All of the items donated to the Center will provide tax benefits to Keesee and the estate. According to Morris, title to the Portfolio has yet to be transferred from the estate to the Center. As far as Morris is concerned, the terms of the sale of the Weston archive represents the best outcome for both Weston”s estate, and for the legacy of Weston”s artistic achievement. Any supposed controversy over the sale, says Morris, is strictly in the mind of Williams, and that Brett never explicitly stated how he wanted his archive disposed of. “I honestly feel the results achieved over the past four years are as good as could have been achieved for this estate,” says Morris. “We”ve done all we can do and I feel good about it. It has not been easy, but it”s my nature to know what I”m doing is right and doing the best job to get the estate closed. “In my opinion the Center will have the definitive collection of Brett”s work and as far as everyone else is concerned they couldn”t be happier,” says Morris. As a coda to the events surrounding the legal fight over the sale of Weston”s archive to Keesee, Williams herself was sued this past October by Morris on behalf of the estate over breach of contract for the remaining two books on Weston”s work, and for the return of 600 Weston photographs intended for those publications. She is also being sued for money Morris says is due the estate as a result of ongoing sales of Weston”s work by Williams at the Photography West Gallery. Williams says she hadn”t gone forward on the other books because Morris told her the estate didn”t want any additional tax liabilities from any additional sales or promotions. Morris denies Williams assertions, and says only that negotiations between the estate and Williams are ongoing and may be resolved in January. “My feeling is she breached her contract for the other two books, and the estate issues have nothing to do with her failure to do the last two books,” says Morris. As loathe as Weston may have been for a large, and largely uninformed audience, it appears as though his reputation will be greatly enlarged in the coming years. In the aftermath of the sale of the Weston archive to Keesee, two questions remain-whether this area lost an invaluable local treasure, and how Brett Weston and his tremendous artistic achievement will be assessed by art historians and the public at large. Despite questions raised by Williams and Weston”s brother Cole over whether Brett would have approved a sale that included several hundred negatives and the licensing of the electronic publishing rights, based on steps taken so far, Keesee and Burris have shown great savvy and seem serious and forthright in their desire to build on Weston”s legacy in a positive way. As far as concerns that the sale to Keesee represents the loss of a valuable local treasure, Burris insists Weston”s value and representation goes beyond such parochial concerns. “Brett was one of the great American landscape artists and it is unfair to relegate him just to the California school,” says Burris. “If you took a handful of the top six American photographers he is certainly one of them. The fact that any one artist could physically create an archive this wide-ranging is amazing in and of itself. As far as Williams is concerned, her feelings are decidedly mixed regarding the sale of Weston”s archive and tied deeply to her personal feeling for Brett as an artist and friend. “I feel as far as Brett”s legacy is concerned the local area lost a tremendous archive, one of the most important artistic archives that exists in the history of photography ever created,” says Williams, “but I don”t think [the sale to Keesee] was the worst thing that could have happened. “My concerns for Brett”s work is it”s never been organized or assembled. No scholars or public institutions have had an opportunity for study,” adds Williams. “My overwhelming response is sorrow about the irony of it. It seems so sad it was turned into this big commercial investment. Brett was a visual genius and had as sophisticated an eye as perhaps the most sophisticated 20th-century painters and abstractionists. That is his legacy.